This Baked Truffled Brie En Croute Recipe makes a beautiful and delicious appetizer to serve at your next get together with family and friends. Brie en Croute is French for “Brie in a Crust.” Truffle lovers will especially enjoy this appetizer with the addition of sensual truffles and truffle oil! What could be better? 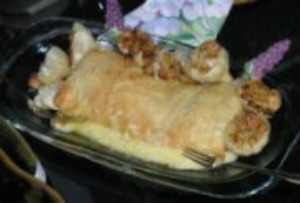 Baked Brie or Brie en Croute is a treat for any fan of cooking with cheese. This fantastic dish is so easy to put together using puff pastry. Give this brie recipe a try! At room temperature, Brie cheese becomes deliciously creamy – when warmed, it positively oozes. On a lightly floured surface, roll out sheet of puff pastry 1/8-inch thick (approximately 15 inches in diameter). Using the brie as a guide, cut out one round the size of the brie for the top and cut another round 1-inch larger. Using a small cutter (any shape will do), cut out some decorative pieces. On prepared baking pan, center the brie cheese on top of the larger pastry round; wrap pastry up over brie (without stretching). Brush border with some egg and top with remaining smaller pastry round; pressing edges of dough together gently but firmly to seal. Brush top with egg. Arrange decorative pieces over the top of the pastry dough; lightly brush with egg, being careful not to leg egg drip over edges (this would prevent them from rising). With the back of a table knife, gently score side of pastry with vertical marks (being careful not to pierce through dough). Chill brie, uncovered, 30 minutes to set egg wash.
Brie may be made to this point one day ahead and kept chilled, covered loosely. * NOTE: You always want to maximize the truffle flavor, using the least amount of the ingredient as possible. So always slice into paper-thin wedges or strips. Use a truffle shaver (similar to a cheese grater) when shaving truffles.